We have been trying for weeks to get Samantha to try any sort of self-feeding. Her physical therapist gave us some new ideas on Wednesday, and within a day she was tentatively trying little Gerber puffs. Then I brought out the Cheerios, and WOW! This morning, she was turning down oatmeal, which she loves, to pick the Cheerios off of her highchair tray. Another big step for Baby Sam! 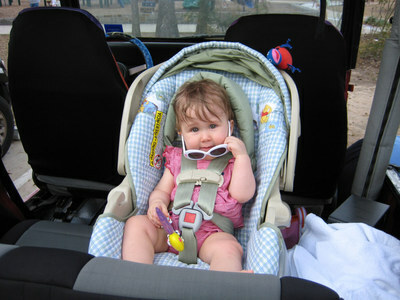 Sam took her first ride in Mommy's Jeep the other day. Dad rode in front while Mom sat in back to be sure the open-air experience didn't completely overload our sweet girl. Check out this windblown beauty! We went to the neurologist yesterday. Great visit. He thinks her head is perfectly shaped. If you weren't in on the laughs, the nanny and I had a panic attack one day when we noticed some lumps on her head and almost took her to the ER. The nanny and I have some sort of collaborative psychosis; whenever we are together, we imagine that all kinds of things are wrong with this kid. I can't count the number of times we've called the doctor together. Anyway, we weren't there because of her head shape. This was her regular check-in. She impressed everyone there with her beautiful eyes (and complete lack of downgaze!!!! ), cheery, social attitude and love of play. The doctor was so pleased with her development that, barring any new issues, he does not think he needs to see her for six months! We prayed so hard for this... I can't believe it is working out so quickly. This one came out after the baby went to bed last night. So, it seems that all the mommies around here refer to the various parks based on their major play features. You can imagine how this one got its name. Carl and I walked about 1/2 mile to this park on Saturday. It was a gorgeous day - about 70 degrees and sunny. About halfway to the park, some ominous clouds began to loom in the direction of our house. Ever optimists, we pressed on. 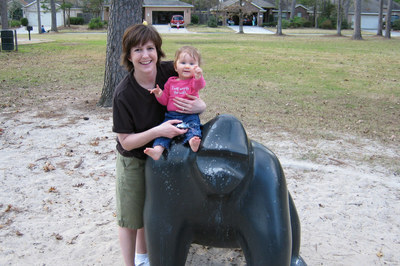 Samantha had a great time on the swings, and we enjoyed visiting with our friend Dorit, who joined us with her dog. We played for about 1/2 hour and then headed back home. The sky was growing darker, and it was beginning to sprinkle. We ran the last 1/4 mile with Sam hanging on tight to her little Jeep stroller and the rain pouring down. She didn't make a peep, but her eyes were like saucers as the thunder started. By the time we made it to the house, we looked like we'd all had a shower in our play clothes. With relief, we turned the key in the lock... and it didn't work! Our lock chose a remarkably poor time to break. Sadly, I was too focused on getting us all dried off to remember to take a picture, but you can imagine what a bedraggled bunch we were. 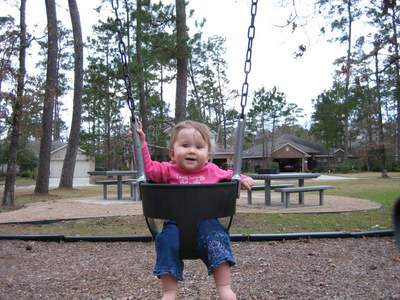 But check out that happy baby on the swing! It was worth it. I am thrilled to report that Samantha is becoming a much more social girl. She has been fine with adults for some time, but loud noises and quick movements have always startled her. And since most of the kids I know are top sources of loud noises and quick movements... well, you see where this is going. But last weekend, our friends Greg and Sherry were in town from DC with their adorable son Ridge, who is walking and chattering away at 17 months. He was a big bundle of energy, diving headfirst into Sam's toy bin, rolling into her on the floor, and generally doing the things little boys do. At first, there was lots of crying and fussing. By the end of the night, however, he was lying on the floor next to her and she was patting him on the head and playing with his hair. He even gave her a kiss! Well, not exactly... It seems Ridge usually receives the kisses, so he actually just leans in really close... but we're all sure it was meant to be a kiss. Today, we had a playdate at our house with a girl who used to scare Samantha to death. Sweet child, but I have never met a louder baby girl. She literally bellows. 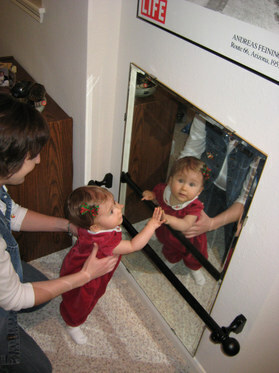 Samantha used to cry the whole time she was here. Today, they actually played together, tapping little plastic rings together and shoving things back and forth. Awesome. For the record, Sam still doesn't stand up. We're mystified. We got some advice yesterday from her therapist that will hopefully encourage her. I am hoping she's just stubborn (and who would be surprised by that?). Oh - and last weekend we made a quick stop at the zoo again while we were downtown for lunch with friends. 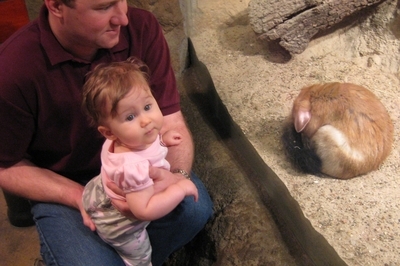 We were particularly delighted with this little springhaas, who fell asleep right next to the glass. You can see that my new year's resolution was not more timely web updates. Ah, well. If you think this is late, you should see my email inbox. The Christmas festivities closed with one last celebration with Farmor (Helen) and Papa G (Larry). And, of course, MORE PRESENTS! Auntie Caroline and Uncle Barry decided to introduce Baby Samantha to Tiffany blue (thanks, guys... I think...). 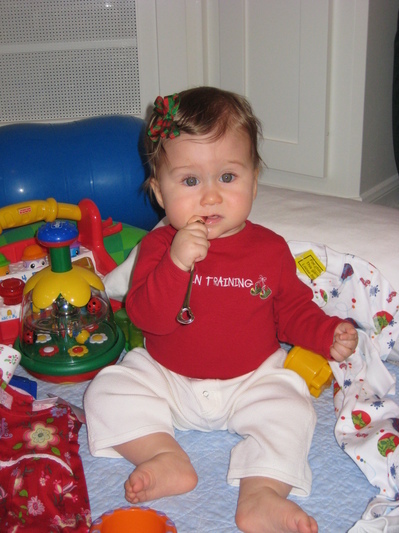 While she wasn't exactly born that way, she now has a Tiffany silver spoon in her mouth! Samantha loved being the center of attention. And the center of all the loot. 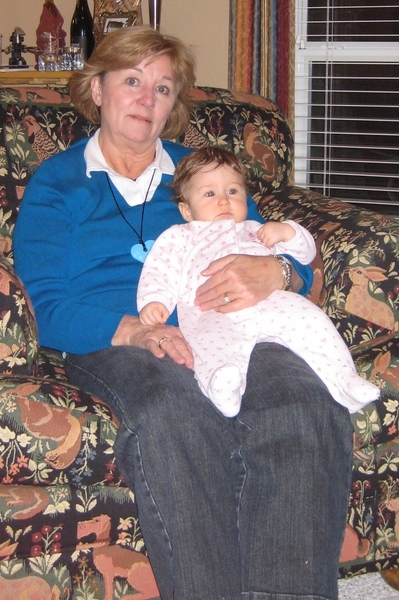 Samantha and Farmor relaxed together and pondered the end of the joyous - if gluttonous - season. We had a great time and particularly appreciated their staying a little longer to watch Samantha while we went tile shopping after our kitchen floor exploded. Perhaps exploded is a strong word. Popped entirely loose of the foundation is more accurate. Now I know how we're spending our Christmas money! The day after Christmas we did a few things we didn't get to on Christmas Day... like stockings! See, I told you we spent a looooong time opening presents! 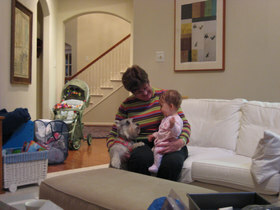 Before my parents drove back to Memphis, Samantha also had to say good bye to their dog, Daisy. 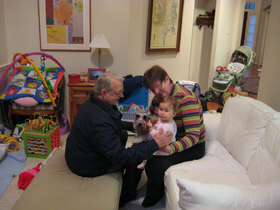 Samantha enjoyed a rather extended holiday season, thanks to visits from many wonderful relatives throughout December. However, her first Christmas day was still very special! 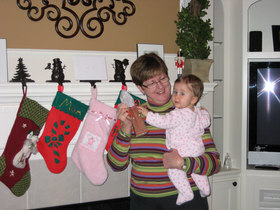 She behaved beautifully given the onslaught of presents, attention, and schedule shifts. Since it was her first Christmas and none of us were in a hurry, we did it her way, and as a result opened presents between meals and naps all day. It wasn't that there were too many presents -- although there really were plenty -- but we had to stop and play with all of the bags, paper, bows, tags, and boxes, in addition to enjoying the gifts themselves. Here, Samantha has "plopped" down and will not be seen standing on her own for weeks. Samantha enjoyed several toys as gifts from friends and family. 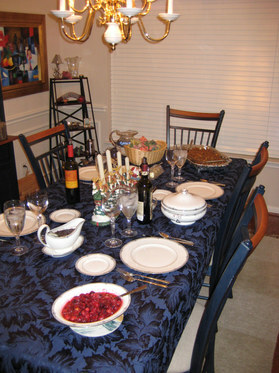 I'm rather proud that I still prepared a traditional Christmas dinner, complete with the china and tablecloth. 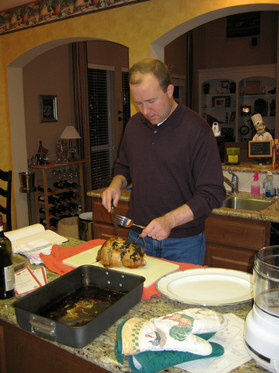 Of course, I have no photographic evidence that I did any of this, but I can prove that Carl carved the turkey breast. I am long overdue in posting this sweet picture of Samantha with Carl's dad. Sam adores her Papa and I know she'd want this to be on the site! 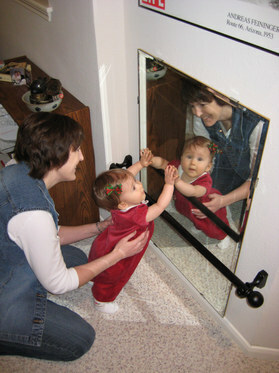 The picture was taken in mid-December when Cal came to visit and to babysit Samantha while Mom and Dad attended a Christmas party. I'm not sure which of them had more fun. I don't think Cal let go of her all weekend. Baby Sam wants YOU to be a Cowboys fan! As you can see, Samantha's been recruiting. 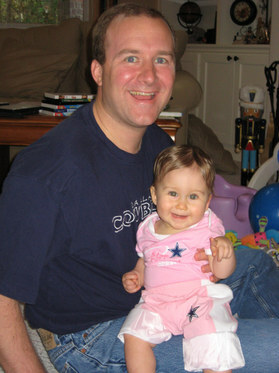 She and Daddy sport their Cowboys gear together. I dread the day she wants to be a Cowboys cheerleader for Halloween. I think that's an "Ask your Dad" dilemma. With all the craziness of the holidays, I haven't really updated the site much in terms of what's going on with Samantha from a developmental perspective. In short, she's doing GREAT. She's definitely rolling, as I mentioned previously. She will roll considerable distances to get to a desirable toy, although with all the grandparents in town over the holidays, that was rarely necessary - everything was brought to her! 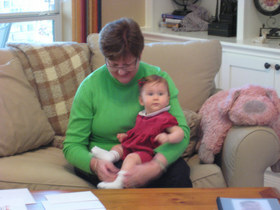 She is babbling more and more, and loves to "sing" back and forth with us. She has always loved to pat on things, and now she seems to be patting to a beat when there is music. That may be coincidence, but it has been interesting to watch. Samantha continues to be a very happy child, and I often smile to hear her giggling in the living room while I work in my office. Of course, there are exceptions, as with any child. For example, Samantha has developed a habit of waking up at about 5:30 am and quickly getting bored, then crying to be retrieved from the crib. We're still working on the strategy for dealing with this. Two nights ago, we left her favorite toy in the crib so she could play with it. This seemed brilliant until we were awakened at 5:40 by a high-pitched squeal of "Hi, I'm Baby Tad!" through the monitor. Hmm. She blew her cover; we didn't think she was strong enough to push the buttons and make him speak by herself. I think she actually did it with her toes. Regardless. we'll have to pick a quieter toy. She has also gone on some sort of strike against standing. 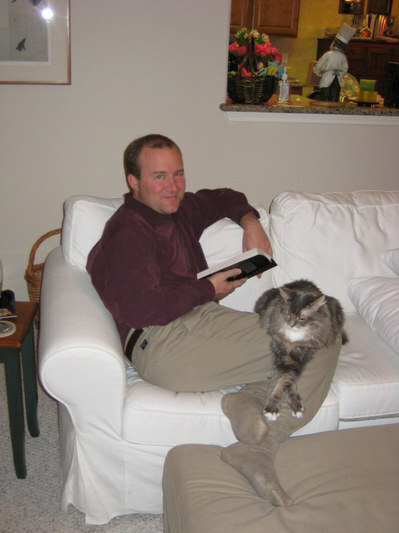 Sam stood with support very early, but over Christmas she suddenly stopped. On Christmas Day, she plopped down to sit while I was holding her, and she's declined to stand ever since. She'll hold her feet straight out in front of her if you try to put her on the ground. She can hold them there a remarkably long time, and when she gets tired she cries in frustration rather than simply putting her feet on the floor. Sigh. 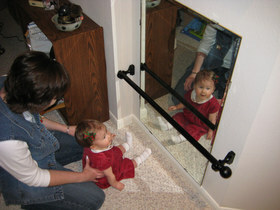 Her therapist has recommended some tough love; lower the seat in her exersaucer so she has to stand up to enjoy playing. We'll try that over the weekend.